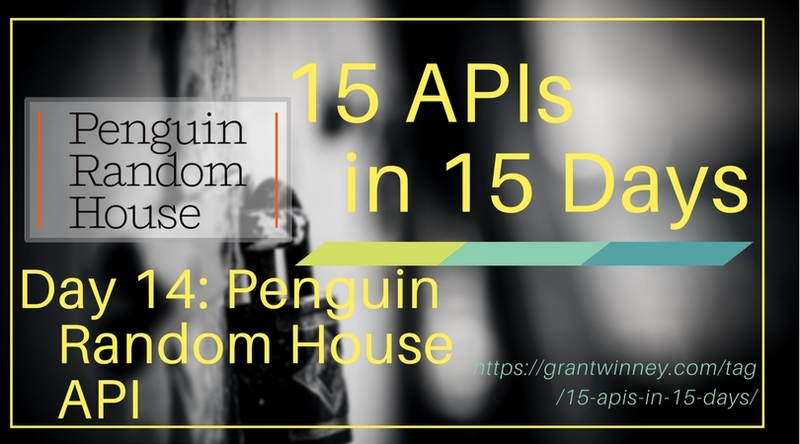 Continuing my search for 15 APIs in 15 Days (also on GitHub), today I'm writing about the Penguin Random House API. Penguin is a book publisher, and their API can be used to get data about books, authors and events. Normally the first thing you have to worry about is some form of authorization and getting an API key. This API doesn't require or even offer it though, so... let's make some requests! Try looking up an author such as Isaac Asimov. You can specify a first and last name, and most likely you'll get multiple author records back - especially if you search for a popular name like "Smith" or something. Here's a very small sample of the returned payload. You get the name back as well as an authorid (we'll use that in a moment), a short bio, and a list of titles (Asimov wrote a lot of books). You can use the authorid value from the previous response (or just use the uri attribute of the author node) to get the details of the author you're interested in. What I find interesting is that it seems to be the same data as the previous request. I'm not sure why, in order to make it faster, the previous endpoint doesn't return less data... maybe a few titles and works to make sure it's the right author in the event of some ambiguity. There's not too much to say about this one. Not sure what the limitations / request throttling might be for this API. It's free, which is nice! The documentation is all in one place and includes examples in php and java, which is nice too.